Spring is a wonderful time for fresh, beautiful desserts — so here are my Top 5 Spring Desserts that are perfect for the time of year! I can’t believe it’s actually that time again… Holiday baking season has come and passed, Valentine’s day and St. Patrick’s day are behind us, and here in sunny California, well, it’s still sunny. But for a lot of you Bold Bakers around the world, the seasons are changing and Spring is almost here! To celebrate one of my favorite times of year I wanted to share with you my Top 5 Spring Deserts! Is there anything more SPRING than the lovely combination of lemon and meringue? My Lemon Meringue Cake is a showstopping recipe that showcases all the flavors in a lemon meringue pie. I love to make this cake for spring birthday celebrations, Easter gatherings, and so much more. My Lemon Meringue Cake features a moist vanilla cake, fresh lemon curd, and a toasted meringue frosting — can you say YUM? Switching over from spring desserts to spring breakfasts, I can never get enough of my Carrot Cake Pancakes! These pancakes are packed with freshly grated carrots, raisins, and cinnamon. I top these with a healthy dollop of cream cheese frosting and toasted pecans. Whether these become part of your spring Sunday brunch or Pancake Tuesday spread, they will have your friends and family asking for not just seconds, but thirds! 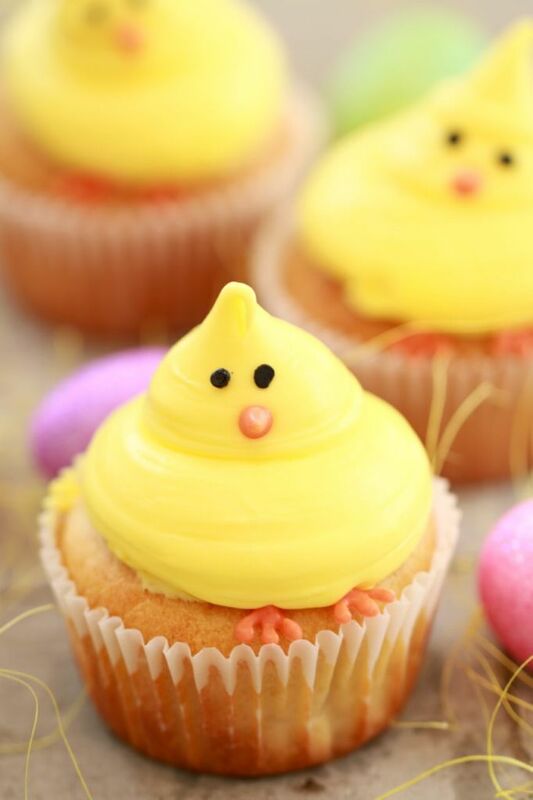 One of the most adorable recipes I’ve created is my Vanilla Chick Baby Cupcakes! These moist and sweet cupcakes decorated to the 9’s to look like little spring chickens are perfect for all kinds of spring occasions. I love to make these with kids as they could not be easier or more fun to decorate! Another great cupcake recipe to welcome the spring season is my Carrot Cake Cupcakes! These little festive cupcakes are carrot flavored through and through. The cupcakes themselves have the sweet carrot cake flavor and they are decorated simply, but beautifully, to look like a garden of fresh carrots! No list of favorites would be complete without including chocolate. No matter what time of year, I’ve got to have chocolate and these Chocolate Mousse Pots With Strawberry Carrots always hit the spot! These are the cutest little pots of chocolate mousse, cookie “dirt,” and a strawberry “carrot” made by dipping a strawberry into orange dyed white chocolate. Try My Other Spring Recipes!